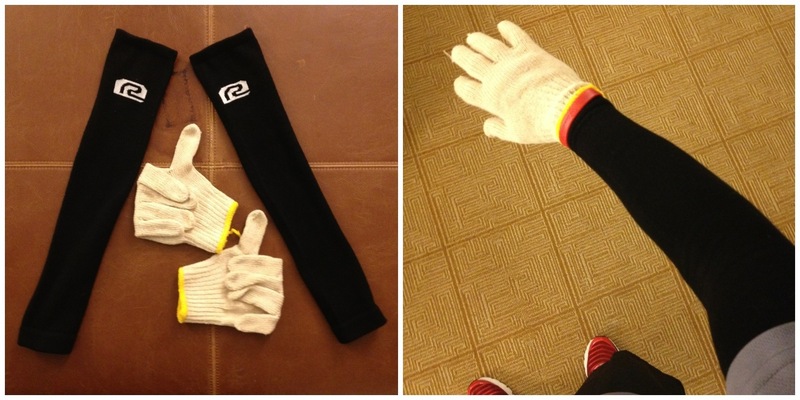 It’s a pair of Road Runner Sports R-Gear Smart Sleeves and a pair of the cheapo, cotton gloves they sell at the expo. Both are easily removeable mid-run, with the arm warmers able to be stashed in my waistband and the gloves tossed in an aid station trash. I tried the combo at home, but it’s been warm, so I wasn’t sure how it would work in cold conditions. I’m in VA this week and it’s been cold on my morning runs (high 40s.) The combo tested out great, so it’s a keeper!